I have a Ph.D. in mathematics from University of Illinois in Chicago. I live in Charlotte, NC with my family. I have a blog Baking and Math where I talk about baking, current and old research in math written for a general audience, and feminism/graduate student life/life. I am a part-time SAT/ACT coach for Testive. I am currently looking for a job in Charlotte, NC, and am open to new opportunities in any field. My strengths are research/task management, teaching/oral and written communication, and getting things done. For more, see the "Community" tab or my CV. My research is in the field of geometric group theory and random groups. My advisor is Daniel Groves. For more, see the "Research" tab. My pronouns are she/her/hers. I graduated from Yale in 2010 with a B.A. in mathematics and philosophy. While an undergrad, I spent one semester in Paris, and one semester in Budapest, Hungary with the Budapest Semesters in Mathematics program, and for kicks I spent that middle summer in Vietnam. I got a M.A. in mathematics from UCSB in 2012. In 2015 I moved from Chicago to Austin, TX with my partner and our kid. In 2017 I moved to Charlotte, NC with the same people + one more kid. More in the "Personal" tab. My friend Kasia took the header photo on this site at the Institute of Advanced Study. 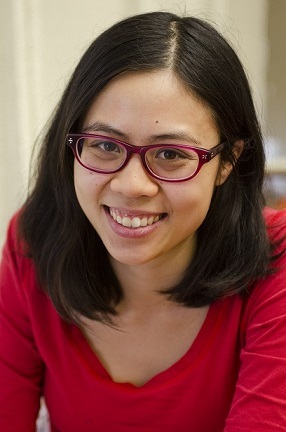 My headshot is from UIC for a newsletter story on women math graduate students.